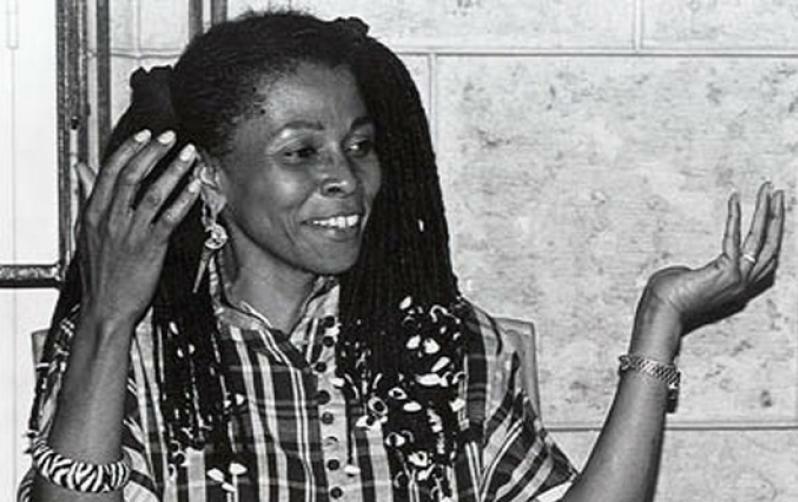 Assata Olugbala Shakur—political activist, author, fugitive, and step-aunt of the famed, slain hip-hop artist Tupac Shakur—was born JoAnne Deborah Bryon on July 16, 1947 in New York City, New York. Following her parents’ divorce in 1950, she moved with her mother and maternal grandparents to Wilmington, North Carolina. Shakur spent much of her adolescence alternating residences between her mother, who remarried and returned to New York, and relatives in Wilmington. Shakur enrolled in Borough of Manhattan Community College before transferring to City College of New York, where her exposure to Black Nationalist organizations profoundly impacted her activism. Shakur attended meetings held by the Golden Drums, where she met her husband, Louis Chesimard. Members of the organization familiarized her with black historical figures that resisted racial oppression and social violence. She also began interacting with other activist groups and subsequently participated in student rights, anti-Vietnam war, and black liberation movements. In 1971, she adopted a new name: Assata (“she who struggles”) Olugbala (“love for the people”) Shakur (“the thankful”). During a trip to Oakland, California in 1970, Shakur became acquainted with the Black Panther Party (BPP). She returned to New York City and joined the Harlem branch. Shakur worked in the BPP breakfast program but grew increasingly critical of the BPP because of their reluctance to collaborate with other black organizations. Shakur left the BPP in 1971 and joined the Black Liberation Army (BLA), which the Federal Bureau of Investigation (FBI) branded an anarchist group. In 1972, the Bureau issued a warrant for her arrest in connection with crimes allegedly committed by the BLA. On the evening of May 2, 1973, Shakur and two BLA companions were stopped by two state troopers for a traffic infraction on the New Jersey Turnpike, an encounter that ended in the deaths of Assata’s friend Zayd Shakur and State Trooper Werner Foerster. Arraigned on charges that included first-degree murder, Shakur went to trial seven times and was eventually convicted of Trooper Foerster’s murder regardless of her contention that the gunshot wound she sustained during the confrontation partially paralyzed her arm and rendered her incapable of firing a weapon. Despite forensic evidence that supports her assertions, she was found guilty of murder in 1977 and sentenced to life in prison plus 30 years. In 1979, Shakur escaped from the maximum security unit of the New Jersey Clinton Correctional Facility for Women. She traveled to Cuba in 1984 where she was granted political asylum and reunited with her daughter Kakuya Amala Olugbala, whom she delivered while imprisoned. In 2013, on the 40th anniversary of Trooper Foerster’s death, the FBI placed Shakur on the Most Wanted Terrorists list, conferring upon her the dubious distinction of being the first woman and the second domestic terrorist to appear on the list. It also increased her bounty to two million dollars. Shakur continues to live in exile in Cuba. Since her escape, Shakur’s life has been depicted in songs, documentaries and various literary works. Shakur, Assata, Assata: An Autobiography (Chicago: Zed Books Ltd., 1987); Mychal Denzel Smith, “Assata Shakur is Not a Terrorist,” The Nation (7 May 1913); Shakur, Assata, “An Open Letter from Assata” 1998; www.fbi.gov.